Texting While Driving: What Should You Do If You Were Injured? What Should You Do If You Were Injured By Someone Who Was Texting While Driving? Unfortunately, thousands of motor vehicle collisions happen daily on our roads, and many result in serious injuries and death. While some of these accidents are unavoidable, the sad truth is that many of them are 100% preventable. Sometimes, people disregard safety and common sense and drive while distracted, causing unnecessary accidents. As you might imagine, one of the ultimate distractions is texting while driving. The National Highway Traffic Safety Administration recently reported that more than 18% of injury crashes were reported as “distraction-affected’ crashes. Texting While Driving: What If it Happens to You? 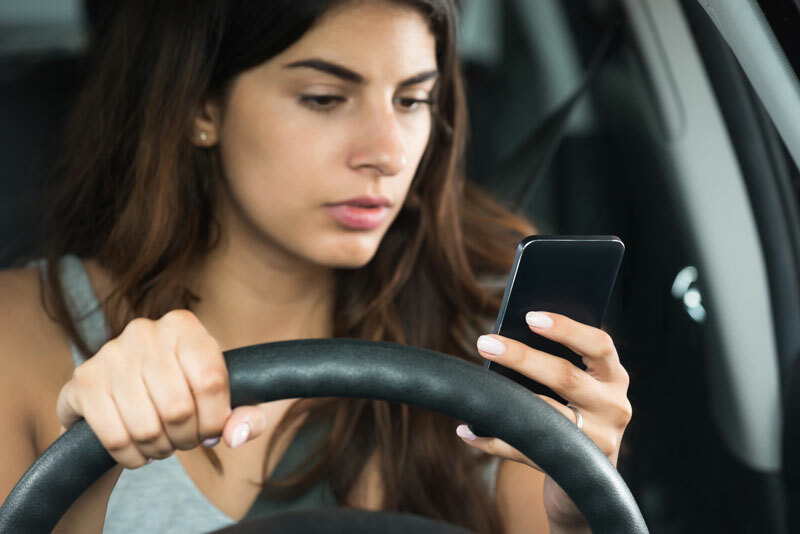 Given these statistics, there is a very real chance that you might find yourself involved in one of these texting-while-driving motor vehicle accidents. What does this mean for you? Does it matter that the person who caused the accident was texting while driving? Does it affect your case if you bring a personal injury lawsuit? What if you suspect that the person who caused the accident was, in fact, texting while driving, but you are not sure? How do you prove the other driver was texting while driving? Here are some things to consider if you’ve been involved in a motor vehicle accident caused by any number of reasons, but particularly if texting while driving was involved . . . If you have been injured in a motor vehicle accident that was caused by someone else, you may be considering bringing a lawsuit in order to recover damages for all you have gone through. If you are thinking about doing so, it is a good idea to have some idea of what you will face. The basis for all personal injury lawsuits resulting from motor vehicle accidents is a legal concept known as negligence. If you cannot prove that the person who caused the accident was negligent in some way, your case is most likely a loser. You must sufficiently demonstrate to the insurance companies and/or the court that the other driver was negligent when he or she caused the accident. This is all a roundabout way of saying that you need to prove that the driver’s actions were responsible for the accident and resulting damages. So, in your specific case, you must show that the driver’s actions of texting while driving (or some other negligent act or omission) directly caused the accident and your resulting injuries. Since you have the obligation of proving that the driver’s negligence directly caused your damages, you have some work to do. In order to claim the other driver was texting while driving and hence distracted, you must present some actual evidence of this. Some of this type of evidence is difficult to obtain, but, with the assistance of a reputable, knowledgeable and experienced personal injury attorney, acquiring this proof becomes much easier. Contact Teale Law Today or call Attorney Charles Teale at 603-935-7245 to discuss your options. The driver’s cell phone service provider is the only entity that can release his or her phone records. However, it will be happy to comply with a court order instructing it to do so. Your attorney will help you obtain this evidence by filing the necessary motions with the court. The records will spell out the exact nature of the driver’s cell phone activity – including what was taking place at the moment of the accident. The records can provide evidence of phone calls, texting (sent and received) and locations of usage. In any type of personal injury case, statements from witnesses are always important – especially statements from those who have clear recollections of seeing the driver texting shortly before or during the accident. The driver’s statements are also particularly powerful, especially if made in haste, panic and a desire to answer a police officer’s questions truthfully. It is amazing how many people implicate themselves with admissions of negligence. Witnesses may hear the driver tell the officer that, “I was on the phone with my father,” or, “I was texting my sister because I was running late.” As you can imagine, such statements are helpful to your case. Today, there are security and traffic cameras just above everywhere. With the help of your attorney, you may be able to access footage from these cameras taken at the time of the accident. Also, photos taken by you and/or the police may be helpful to your case, particularly if they capture evidence of skid marks, traffic signals, and even the location of a cell phone within the car. The purpose of the police report is to create a written record of everything an officer gathers at the scene of the accident. This includes detailed descriptions of witness statements. Also, as we mentioned, witness statements, particularly as recorded in police reports, can have a tremendous impact on your case. If there are any witnesses who observed the driver using his or her phone before or during the accident, the police will (hopefully) obtain a written statement from them. Additionally, if an officer issues any traffic citations, especially for the illegal use of a cell phone while driving, this is documented in the police report and can be very helpful for your case. Simply, drivers have a duty to operate their vehicles on the roadways without being distracted! When a driver does something that breaches that duty – such as texting while driving – and that driver causes an accident, he or she is liable for resulting damages. If you prove your case that the other driver texted while driving and caused your accident and your injuries, you are entitled to receive what is known as reasonable damages. In order to recover the damages that you are entitled to because someone was texting while driving and caused you injuries, you should contact a reputable, knowledgeable personal injury attorney to help you with your case. Evidence is very important in these types of cases. There are also important deadlines that cannot be missed. Attorney Charles Teale can help you effectively deal with insurance companies, medical care providers, the courts, and even your employer. Contact Teale Law today to schedule a complimentary consultation and evaluation of your case. We can be reached at 603-935-7425 or contact@tealelaw.com. Motorcycles in New Hampshire in March? You better believe it! You’ve Been in a Car Accident in New Hampshire: Now What? Personal Injury Lawsuit: Can I Recover Lost Wages and Loss of Earning Capacity?